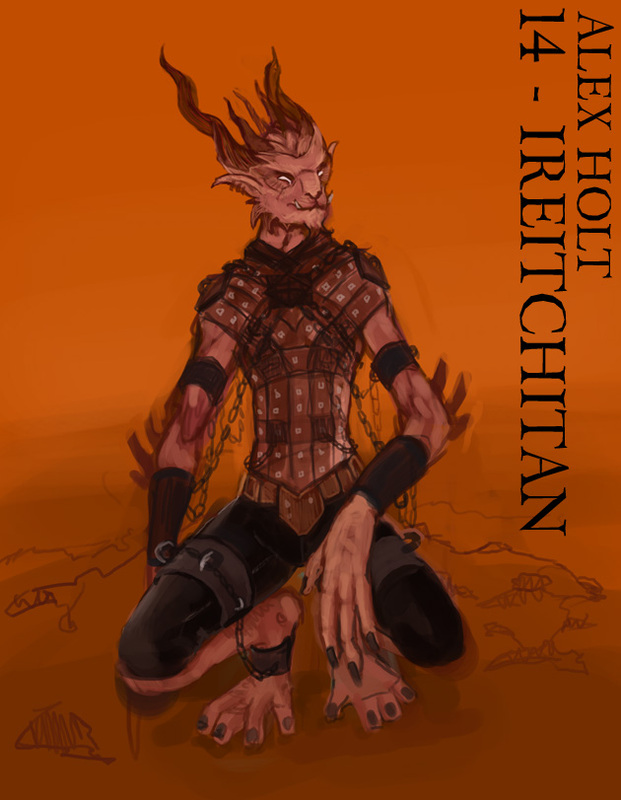 Ireitchitan is a Djinn – a creature of almost pure magic, capable of enormous feats of power and revelling in chaos. He is quite possibly the oldest and most dangerous of his kind, and has suggested that various religious figures of evil were based upon him, although given his perpensity for lying this must be taken for a pinch of salt. Indeed, up until August 12 1876 he was considered one of the three most dangerous villains on the planet. Ireitchitan started off as a concept of a dark god bound into the service of good, and being so good at it it creeps everyone out a little. I decided to change it from Demon to A Djinn as I liked the idea of a something a little more and less predictable than a demon. I’m slightly going with the “Fables” approach to Djinn – wildly powerful beings who are more or less pure magic, although in this case with a bit of a Pan’s Labyrinth aesthetic going on that suggests demonic without actually being one. Fantastic image and concept. I’d love to see some stories with this dude.